The African Heritage Diet features familiar foods prepared in easy and aﬀordable ways. Learn more about the health beneﬁts and the “how-to” of this exciting way to claim health through heritage. 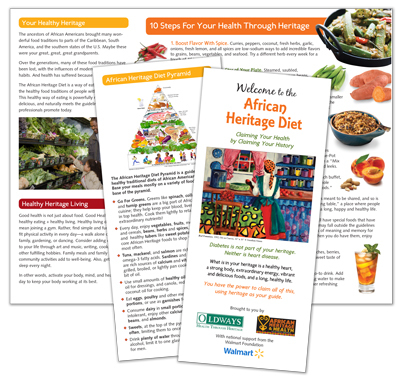 The Welcome to the African Heritage Diet trifold brochure, available either as a downloadable PDF or in hard copy, provides 10 simple steps to get you started eating the African Heritage Way! Available either as a downloadable PDF (at the PDF links above) or as a pre-printed hard copy.